Promotions among the officer corps in the military usually begin by simply putting in time in rate and meeting the standard. It's fairly unusual to not meet the requirements to move from O-1 to O-3. But a few offenses may delay your trajectory or even push you off track for that promotion. Driving under the influence, committing a felony, failing training programs, or not meeting the minimum standards of the military are among the items that can prevent you from being promoted. Changes in authorizations, losses, and promotions to the next higher grade create fluctuations in both the time in service (TIS) and time in grade (TIG) for each of the military services. However, the Department of Defense requires that promotion opportunities for commissioned officers be approximately the same for all of the services, when possible, within constraints of available promotion positions. Commissioned officers are recommended for promotion by their commanders and are selected by centralized (service-wide) promotion boards, which make promotion determinations based upon the officers' promotion records. There are basically three promotion opportunities: Below-the-Zone, In-the-Zone, and Above-the-Zone. Below-the-Zone only applies for promotion to the rank of O-4 to O-6. One year before they would be eligible for In-the-Zone consideration, up to 10 percent of those recommended can be promoted Below-the-Zone. Most promotions occur In-the-Zone. Those not selected In-the-Zone have one more chance, a year later The selection rate for Above-the-Zone is low, around 3 percent. The two most significant factors in officers' promotion records are their fitness report(s) and level of responsibility in their current and past assignments. A negative or mediocre fitness report can result in being passed over. Lack of current or previous assignments that had significant degrees of responsibility can also result in not being selected. Once selected for promotion by the promotion board, not all officers are promoted at the same time. Instead, officers are assigned a line number. Each month, the service releases the line numbers of officers to be promoted. This process ensures a smooth promotion flow throughout the year following the promotion board. Being a Reserve Officer does not mean the officer is serving in the Reserves. 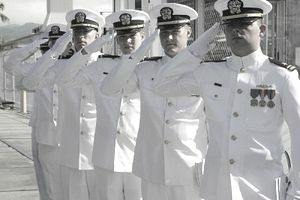 Previously, graduates of the service academies were commissioned as Regular Officers, while those commissioned under ROTC or Officer Candidate School (called Officer Training School in the Air Force) were commissioned as Reserve Officers, who then competed later in their careers to be appointed as Regular Officers. Being a Regular officer means a better chance of being promoted, protects against RIFs (reduction in force) and allows an officer to serve longer. By law, Regular Officers promoted to lieutenant colonel (O-5) may serve for 28 active commissioned years, while those promoted to colonel (O-6) may stay for 30 active commissioned years unless earlier retired by other provisions of law. By policy, Reserve Officers are limited to 20 years of military service; this may be extended as needed to meet specific service requirements. Regular Officers may not be involuntarily released from active duty because of a reduction in the size of the officer force. Reserve Officers, however, serve at the discretion of the Secretary of the service and may be involuntarily released at any time if the personnel ceiling warrants. Because of Regular Officers' greater tenure, they have some advantage over Reserve Officers. The military must obtain a return on a training investment and, therefore, requires officers to serve a certain period of time after the training is completed. To be promoted to O-7, an officer must first complete a full tour in a Joint-Duty-Assignment (this is an assignment to a unit that comprises members from two or more of the services). This requirement can be waived, in some instances. The mandatory retirement age for all general officers is 62 (this can be deferred to age 64 in some cases). Under the law, an officer who has been promoted to O-7 but is not on the recommended list to O-8 must retire five years after promotion to O-7, or 30 years of active duty service, whichever is later. An O-8 must retire five years after being promoted to O-8, or 35 years of service, whichever comes first. The Secretary of the service concerned (i.e., Secretary of the Army, Secretary of the Navy, Secretary of the Air Force) or the President of the United States can defer the above mandatory retirements, up until the time that the officer reaches the age of 62.